Summer vagrant; breeds sporadically. Winter and migration; regular visitant. The Carolina Wren was very rare during the Minnesota Breeding Bird Atlas (MBBA). Widely found in the southeastern United States from southeastern Texas east to Florida and up the Atlantic states to southern New England, then westward to the southern Great Lakes states, Iowa, the Missouri-Nebraska border, and south to eastern Texas. The species also has year-round populations in northeastern Mexico and the Yucatan. High densities occur throughout the southeastern United States but especially in northern Florida, southern Georgia, and southern Alabama (Figure 1). A permanent resident in its primary breeding range, but in Minnesota it is a visitant in fall, winter, and spring; especially found at feeders for extended periods of time. Mostly insects of many species, spiders, sometimes small frogs and lizards. Consumes berries and fruits in winter and frequents feeders for seed and suet. A domed construction placed in a variety of cavities and openings; the hole for the nest site can be in natural sites, such as tree cavities, dense brush, and rocky nooks, and in human structures, such as outbuildings, mailboxes, flowerpots, and abandoned nest boxes. Breeding distribution and relative abundance of the Carolina Wren in North America based on the federal Breeding Bird Survey, 2011–2015 (Sauer et al. 2017). The assessment that Roberts (1932) made about the presence of the Carolina Wren in Minnesota is related in his chapter “Some Changes in the Bird-Life of Minnesota in Recent Years,” where he put this wren on a list of seven species from the south that were “rare fifty years ago” and “are becoming more frequent and spreading northward but are still nowhere common though they can now be removed from the purely ‘accidental list.’” The observations Roberts cited from his network of contributors are from the 1920s, although he cited a few records from the literature, including one from “Little Rock” (now Chaska) in 1848, and one by P. L. Hatch, who collected this species in 1868 in Minneapolis. The confirmed breeding evidence Roberts gave is from the “outskirts” of St. Paul in the spring of 1927, when a pair built a nest in the eaves of a garage and successfully reared young. The records cited in the two subsequent Minnesota bird books (Green and Janssen 1975; Janssen 1987) mostly provide migration and wintering dates; the description of summer occurrences was the same in both books: “In the summer there are former records [from the 1950s to early 1970s] of family groups or nests from Houston, Fillmore, Ramsey and Washington Counties. There are no recent breeding records.” The Houston breeding record of 4 young, August 2, 1947, is documented (Thompson 1947), and the Ramsey County record is from Roberts; no other documentation was found for the other 2 counties, but the locations are credible. Most of these records were from the southeastern counties north to the Twin Cities and included multiple yearly incidental records in Hennepin, Houston, Mower, Olmsted, and Washington Counties. There are a few northern county records: (1) migration vagrant hot spots along the North Shore of Lake Superior (Duluth: 1981, 1976, 1995, 1999; Cook County: 1983, 2001); (2) Merrifield, Crow Wing County, November 2 to December 18, 1983 (Weaver 1984); and (3) Otter Tail County, November 19, 1999 to May 24, 2000 (Edwards and Edwards 2000). The latter record is interesting because the bird was fed all winter with copious amounts of mealworms and in the spring built a nest and laid 5 eggs that were infertile because she lacked a mate. One summer record from the period 1961 to 2000—a pair in Rochester, July 22, 1986, to mid-August—may indicate an incidental breeding attempt (Plunkett 1986). Since 2001, there has been an increase in Carolina Wren reports for all four seasons published in the Minnesota Ornithologists’ Union seasonal reports. Beyond the usual range (the Twin Cities southeast to the Iowa border), there were 20 incidental observations as far north as Lake and Beltrami Counties, and as far west as Clay and Yellow Medicine Counties. This influx period also produced the first actual breeding record since 1947, from Rochester, Olmsted County. In northeast Rochester west of Quarry Hill Park, an overwintering pair nested in a garage, and on May 1, 2007, the incubating female was found sitting on 6 eggs; it is not known if they hatched (Budde et al. 2007; Kessen and Svingen 2009). Rochester, Olmsted County. Block: T106R14a, Lance Vrieze; evidence code: probable, pair (P); observations suitable habitat, neighborhood yards: 8/20/2012 “singing throughout the day,” 8/22/2012 one; and 8/24/2012 pair. Preston, Fillmore County. Block: T102R10d, Nancy Overcott; evidence code: probable (S); observation heard bird from deck 7/6/2010 and on deck and bird bath 7/10/2010, suitable habitat. A bird was also observed on 7/3/2012 from her deck. There were also incidental summer reports of Carolina Wrens from 2009 to 2013 in the MOU database that could not be geographically placed except by county: Dakota, June 6, 2009; Faribault, July 15, 2011; Hennepin, August 2, 2012; Washington, August 2, 2012; and Rice, August 21, 2012. All this information is provided to indicate that the sedentary and territorial Carolina Wren may be a permanent resident, not just a visitant or vagrant. Places like Rochester, where there are multiple records going back several decades, should be checked carefully for continuity of occupancy and evidence of breeding. Breeding distribution of the Carolina Wren in Minnesota based on the Breeding Bird Atlas (2009 – 2013). Summary statistics for the Carolina Wren observations by breeding status category for all blocks and priority blocks (each 5 km x 5 km) surveyed during the Minnesota Breeding Bird Atlas (2009-2013). Found in deciduous forests, the Carolina Wren nests along brushy edges, in the thick understory, or in disturbance gaps with tangled vegetation. Bottomland forests are often used, as are swamps, streams, and wetland margins with dense vegetation. The species has adapted well to human settlement and breeds in wooded suburbs and towns with areas of dense brushy vegetation, rocky crevices, or unused human structures or debris that provide suitable nesting cavities. Partners in Flight estimated the population of the Carolina Wren in the United States and Canada as 18 million birds (Rosenberg et al. 2016). 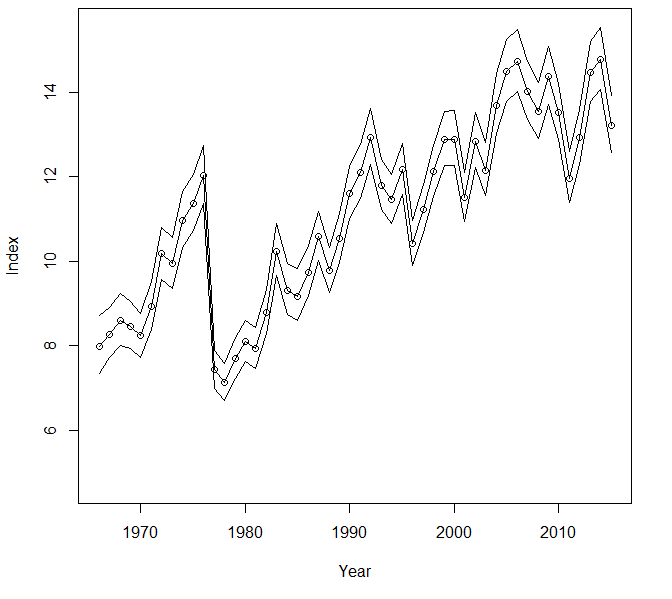 The population trend, as measured by the federal Breeding Bird Survey, indicates that the species is doing very well. Across the United States, the Carolina Wren significantly increased by 1.04% per year from 1966 to 2015 (Figure 3). The species has been increasing in all states and regions where it occurs in sufficient numbers, except for the Peninsular Florida region, where it has been declining. Rosenberg et al. (2016) estimated that the species’ population had increased by 71% from 1970 to 2014. The Carolina Wren is an abundant species, and it has a strong tendency to wander northward and somewhat to the west. Its populations in peripheral areas of its range are subject to fluctuations due to weather. Persistent snow cover and prolonged cold are detrimental to its survival in the North, and dry spells may be detrimental in the West (Haggerty and Morton 2014). The stability of its northern range expansions depends on climate and weather factors, which historically have fluctuated. Carolina Wren range extensions have continued from the early 20th century to the 21st century (Haggerty and Morton 2014), and the species will likely respond positively to future climate change as well. Breeding population trend for the Carolina Wren in the United States for 1966–2015 based on the federal Breeding Bird Survey (Sauer et al 2017). The Continental Concern Score for the Carolina Wren was relatively low at 7/20 (Rosenberg et al. 2016), and it is not considered a species of conservation concern. As for most wildlife species, habitat degradation and ecosystem contamination probably have had some influence on its population. For instance, the Carolina Wren was used as a test species because it had high levels of mercury in its blood. This was due to its year-round foraging on spiders. Spiders are apex predators in the arthropod world and hence at a higher trophic level compared with other invertebrate prey. The high mercury loads in Carolina Wrens at contaminated sites were found to affect its nesting success compared to that at reference sites (Jackson et al. 2011). Budde, Paul E., Robert M. Dunlap, Doug W. Kieser, James W. Lind, William C. Marengo, and Peder H. Svingen. 2007. “The Spring Season, 1 March–31 May 2007.” Loon 79: 197–229. Edwards, Eddy, and Judy Edwards. 2000. “Carolina Wren Visits Otter Tail County.” Loon 72: 243–244. Jackson, Allyson K., David C. Evers, Matthew A. Etterson, Anne M. Condon, Sarah B. Folsom, Jennifer Detweiler, John Schmerfeld, and Daniel A. Cristol. 2011. “Mercury Exposure Affects the Reproductive Success of a Free-Living Terrestrial Songbird, the Carolina Wren (Thryothorus ludovicianus).” Auk 128: 759–769. Kessen, Ann E., and Peder H. Svingen. 2008. “The Summer Season, 1 June through 31 July 2007.” Loon 80: 16–40. Plunkett, Anne Marie. 1986. “Carolina Wrens at Rochester.” Loon 58: 143–144. Thompson, Milton D. 1947. “Field Trip in Houston County.” Flicker 19: 70–71. Weaver, Peg. 1984. “Carolina Wren in Crow Wing County.” Loon 56: 72.